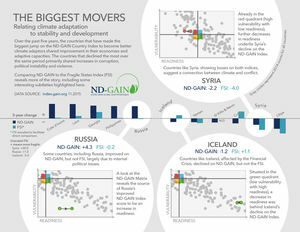 “Interestingly, several countries with the biggest losses on ND-GAIN Country Index are also very fragile, suggesting a connection between climate and conflict,” notes ND-GAIN scientific adviser Ian Noble. 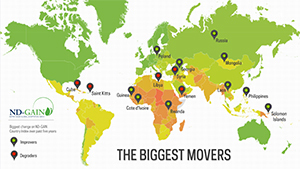 Comparing ND-GAIN to the Fund for Peace’s Fragile States Index, Libya, Syria and Yemen are some of the poorest performers over the past five years on both of these indices. On the other hand, Ukraine is also doing poorly on FSI, but not on ND-GAIN, possibly because the conflict there arose from pressures outside its borders. A recording of the press event webinar will be available on Wednesday (Nov. 18) at nd-gain.org. Originally published by Joyce Coffee at news.nd.edu on November 17, 2015.